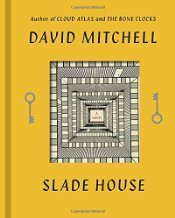 Spanning five decades, from the last days of the 1970s to the present, leaping genres, and barreling toward an astonishing conclusion, this intricately woven novel will pull you into a reality-warping new vision of the haunted house story — as only David Mitchell could imagine it. Slade House is a fever dream-induced tale with familiar ghost story and horror tropes all mixed together to bring us something new. Slade House isn't your typical haunted house; it only appears every 9 years and only to a particular person(s). This selected person finds themselves wandering down Slade Alley when they come upon the small door in the wall and when entering the door find themselves in the beautiful garden of Slade House. Here, they meet either the sister or brother who reside in Slade House, and while at first all of this seems wildly normal, by this point it is too late for them and they will never leave Slade House. Each chapter of the book takes place in a different decade and is told in a first person narrative from the point of view of that decade's selected guest. I have to admit that the opening chapter, which takes place in 1979 and is from the POV of a young autistic boy, was the strongest for me, with each subsequent chapter feeling slightly less compelling. Not that the later chapters didn't hold up, there was just something about that opening chapter that struck a chord with me. It wasn't until after I read Slade House that I discovered it had ties to Mitchell's previous book, The Bone Clocks (which I have not read), so I can't tell you what those ties are, but I'm definitely going to want to read that now, and probably follow it up again with Slade House. However, you don't need to have read The Bone Clocks in order to understand what's going on in Slade House, as I'm assuming the connections between both books must be minimal, as I didn't seem to be missing anything in the story when I read it. If you like ghost stories or horror, I think Slade House would work for you. It's dark and atmospheric and does a great job at upping the creepy factor.